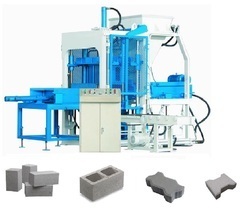 Our product range includes a wide range of fully automatic hydraulic and multifunction block machine, fully automatic multi function block machine, fully automatic brick and block machine and fully automatic solid block and brick machine. The whole process uses a PLC APTITUDE CONTROL AND DIALOGUE SYSTEM OF HUMAN-MACHINE INTERFACE, easy to analyze the change signal, ensure the best operation effect. Super-strong steel structure made of extensive imported original parts, ensuring more stability and reliability for the main machine body. The whole process use a PLC aptitude control and dialogue system of human-machine interface, easy to analyze the chance signal, ensure the best operation effect. This is multifunction Machine and Fully HydraulicThis machine is suitable for High Production of Bricks, Blocks and Pavers. This is High speed multifunction Block Machine with high technology. 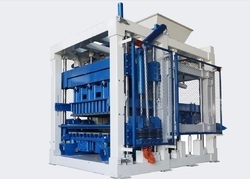 This automatic block making machine is designed with the heavy duty frame that is made of high intensity steel with progressive thermal treatment. Both the machine and the mould are high abrasion resistant.